We here at Oakley Property Shoreham are very excited to announce the VIP launch of The Waterfront, Shoreham’s new number one address, on Saturday 27th April at the wonderful Ropetackle Arts Centre on Shoreham’s High Street. This exclusive event is open only to potential buyers who pre-register their interest with us here at Oakley Property. This, however, will provide you will a fantastic opportunity to meet the team behind the project, to view the site model, to see and feel the samples and get your hands on the brand-new brochure in advance of the official public launch. At this event, you will also be able to be one of the first to book a private appointment with us to view the new show home as soon as it is released and to reserve your prime plot off-plan, again ahead of the general public launch. There has as you can imagine been a tremendous buzz around this project, and we have to say that interest has been astonishingly high but there is still time to reserve yourself a space at this invite-only VIP launch. 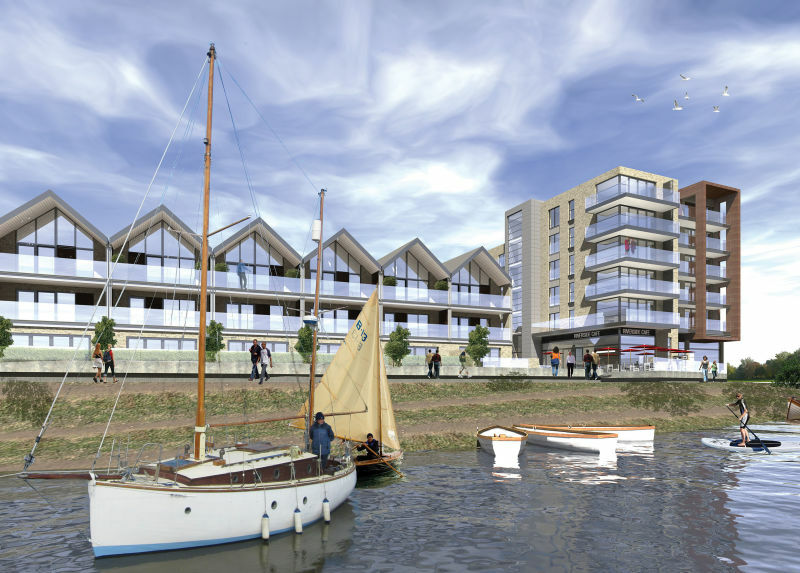 The Waterfront is a luxury new development of 120 riverside homes comprising of 1 & 2-bedroom apartments, 3-bedroom townhouses and stunning 4-bedroom waterfront homes in the heart of Shoreham. The feel of the development is one of a luxurious contemporary design that sits within the tone of the surroundings of the coast and the countryside. The Waterfront will, of course, be finished to a high specification as one would expect but with a vision of a modern vibrant lifestyle with flexible living spaces for you to enjoy with family and friends. The Waterfront is a development that is rather different to many others in that it is promoting a holistic approach to your new home with the regeneration drawing in a whole new community and then bringing it to life. The vibe is set by the tranquil sounds of nature and the water that surrounds this stunning new development. The far-reaching sea views coupled with the setting of The Waterfront in the foot of the South Downs sets the tone for a relaxed and rejuvenating lifestyle. This is all though conveniently located so you can get out an about and enjoy the coastline, the South Downs, city life in nearby Brighton and beyond. Due to such high demand, we advise that you register your interest in The Waterfront as soon as possible to assure your place at this VIP event. You can call the team here at Oakley Property on 01273 661577, or email us at shoreham@oakleyproperty.com or even visit the website www.thewaterfrontshoreham.co.uk and complete the registration form on there. A further email will then be sent to you with details of how to book your exclusive appointment to view the stunning Waterfront on the 27th April. We are looking forward to seeing you there.